Mississippi Mud Cakes are popular in the South – a rich chocolate sheet cake with chocolate chips, nuts and marshmallows. 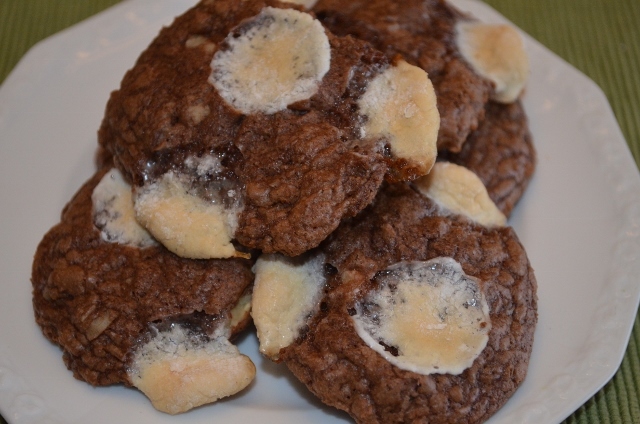 This is a cookie recipe that uses the same basic ingredients to make a chewy chocolate cookie. Good at Christmas or anytime of the year. 1. Microwave semisweet chocolate morsels in a small microwave-safe glass bowl at HIGH 1 minute or until smooth, stirring every 30 seconds. 2. Beat butter and sugar at medium speed with an electric mixer until creamy; add eggs one at a time, beating until blended after each addition. Beat in vanilla and melted chocolate. 3. Combine flour, baking powder, and salt; gradually add to chocolate mixture, beating until well blended. Stir in chopped pecans and 1/2 cup milk chocolate morsels. 4. Drop dough by heaping tablespoonfuls onto parchment paper-lined baking sheets. Press 3 marshmallows into each portion of dough. 5. Bake at 350 degrees for 10-12 minutes or until set. Remove to wire racks.